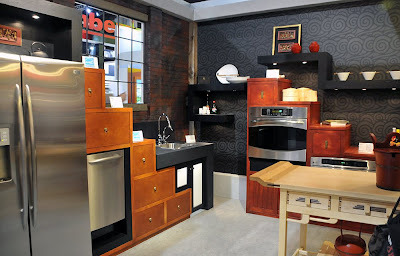 My sources tell me that this kitchen was featured at the GE KBIS booth in Atlanta last weekend. GE?! Really? Interesting design is not the thought that pops into my head immediately upon hearing the name GE, I have to tell you. This kitchen's really clever and beautiful. Aside from all the crap that's cluttering it up, the cabinetry alone in this thing is impressive. The wall shelves echoing the shape and color of the counters and supports is genius. 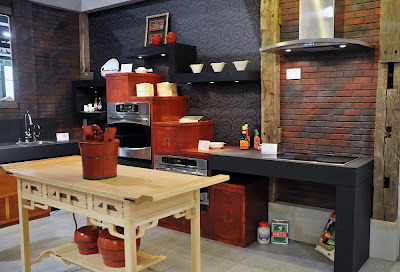 I love the idea of taking something like a Chinese chest of drawers and interpreting it as kitchen cabinetry. Bravo GE, good job.